Use the information on this page to plan and organize your order. When you visit our EMAIL ORDER FORM, it is less confusing if you understand all the details that you need before you go there. For Stealth PRO, there are several guitar details that you must give to us so that your hookup diagram matches your guitar. The following outline will help you to organize everything you need. You can click on a printable PDF version of this Organization Outline, so you can write down all the necessary info on your order form. First, make sure you have read the INSTALLATION, CONTROLS, and POWER OPTIONS pages if you are ordering the Stealth PRO. The circuit board measures 3.75 x 1.1 in, 1/2 in. thick (95mm x 28mm x 12.5mm). It takes the bridge pickup signal, amplifies/processes it, and sends the amplified/processed signal to the Sustainiac driver. When the Sustainiac is OFF, the Sustainiac driver is used as an active pickup. The sustainer circuit now amplifies the tiny driver pickup signal to a useable level. Pickup equalization is is done on the circuit board. Two wires are provided to allow switching between single-coil (SC) and humbucker (HB) sound. We now supply two board equalizations: (1) Clear wrapper for guitars with humbucker bridge pickup; (2) white wrapper for guitars with single-coil bridge pickup (standard Strats). Push-pull (standard control for our kit) ON/OFF control uses only the switch portion of the control. Therefore, the original pot function (volume/tone etc.) will still retain its original function. Push-pull (standard control for our kit) ON/OFF control uses BOTH the switch portion of the control. Therefore, the original pot function (volume/tone etc.) will LOSE its original function. Superswitch or rotary switch for Sustainiac control, can be ordered instead of push-pull or toggles. BATTERY/POWER OPTIONS: See POWER OPTIONS page for details. Deluxe battery case (optional, $16 for single, $25 for dual, requires routing) This is a recommended option, because sustainers use up 9-volt batteries much faster than preamp-type effects. You will have to route out a cavity in the back of the guitar body to accept the battery case. We charge $25 to route this cavity if we do your installation. Use the dual case if you have active pickups such as EMG. Inside trem. spring cover (with battery snap); Order trem-spring cover (black or white) with pop-off door for quick battery change, $7.50. This is the next best option. For 3-spring cavities, you move all 3 over to one side of the cavity. This doesn't affect tremolo operation. You might need to make some cavities a little deeper and/or wider to accept the battery. The door pops open with a pick or a coin. Guitar information: Each one of the installation drawings in our rather large library is based on the following specific information about pickup configuration, guitar controls (pickup selector, volume/tone controls), and output jack type. 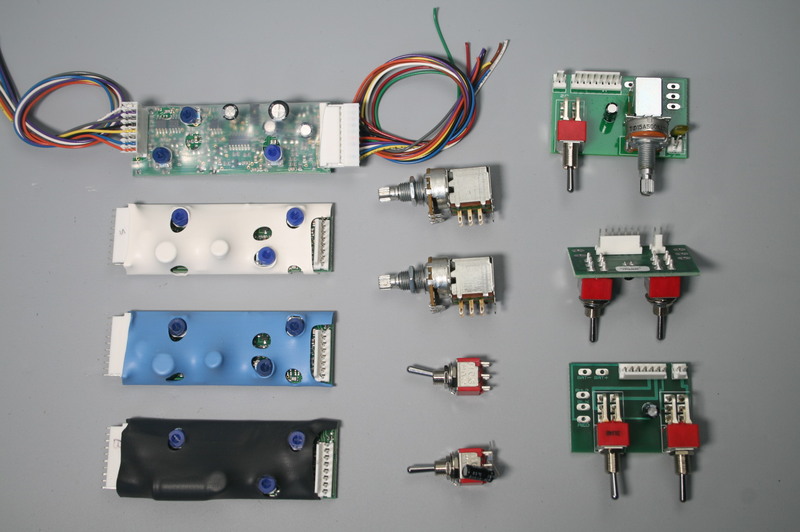 Without complete and accurate information, we cannot possibly send you the proper kit of parts. You will likely have to examine the inside of your guitar's electronics cavity. What type pickup selector does your guitar have? Each drawing is based on the pickup switch type. Please know what you have before you order. "CRL" switch. Has 8 contacts, 4 on each side of the wafer. This is the switch that Fender has used for decades. Simple, reliable, good "feel". Open construction so you can observe what is happening. 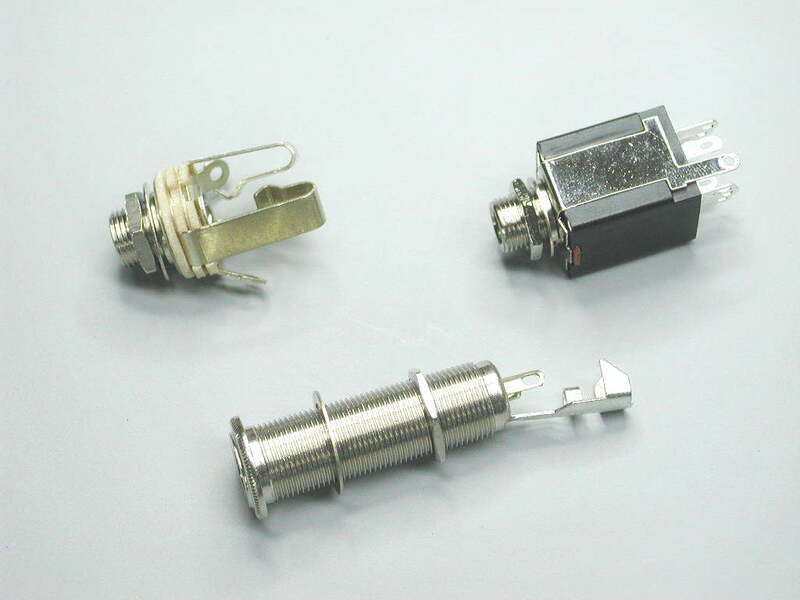 What type output jack does your guitar have? 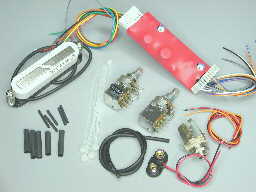 The kit includes a stereo output jack for battery connection/disconnection. Replaces your mono jack. Guitar jack options See picture: Output jack choices, low resolution (10KB); Output jack choices, high resolution (70KB). Open style (mounting nut is visible on the outside of the guitar), upper left in pictures. The mounting nut is visible on the outside of the guitar. These jacks are usually mounted to a metal plate on the side of the guitar, or onto a Strat-type mounting plate on the front of the guitar. Barrel style (mounting nut is NOT visible on the outside of the guitar), bottom in pictures, also called "cylindrical". Has a 1.5 inch long body that is completely threaded. Internal contacts are not visible. You can tell by looking on the outside of your guitar, these jacks have no visible mounting nut, because the mounting nut is inside the guitar body. SUSTAINIACâ STEALTH PLUS ELECTROMAGNETIC SUSTAINER INSTALLATION INFO Obsolete model.